My very first attempt at a major modification to the exterior of my car and almost a year to the day it's finally finished. Granted almost 6 months was spent procuring the hood in the first place but nonetheless it took a whole year. As with all things I do with my car these days modifications seem to take longer and longer as you will see in the following description of what the job entailed ....for me. 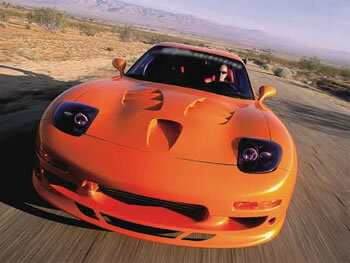 One of the critical flaws in the overall design of the 3rd generation RX-7 is it's marginal cooling systems. Not only a function of the cooling system itself but a culmination of compromises. 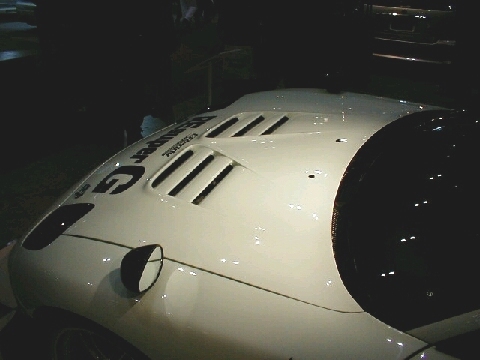 To maintain the best aerodynamics the nose of the car is made low and small (minimal frontal area). This in turn reduces the airflow available for a radiator. In the 3rd generation RX-7 to fit a "big" radiator, Mazda tilted it forward and added a pair of pretty good high flowing fans. And here begins the problem. Due to the small nose the nose opening was also small. So the source of cooling air on the inlet side is limited. On the outlet side the heated air, having passed through the radiator, now has a tortuous path past the engine and out and under the car at the back of the engine bay. Of course as it makes it's way this hot air heats everything in it's path. A similar story can be told for the intercooler. Sourcing inlet air from a restricted location it also has compromised flow not to mention the fact that being located under the hood it is exposed to radiant heat from the engine and convective heat from the hot air coming from the radiator. All this leading to a wholly ineffective IC. 8) use a synthetic motor oil with dual oil coolers (mine is an R1 model but larger oil coolers would be nice). So what's left to do? All the hardware has been upgraded without major component geometry changes and within a budget and with the inlet side of all the systems optimized it seems only logical to address the outlet side of the equation. One solution, punching some big holes in the hood to let all that exhaust heat out - both from the radiator, the intercooler, and all the radiant heat from the engine and the turbos. A vented hood is in order. 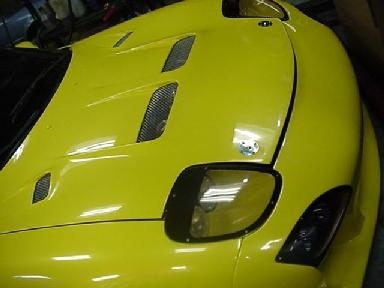 A vented hood has always been something I wanted to add to my car but the cost always seemed so prohibitive and other things always seemed to take priority. 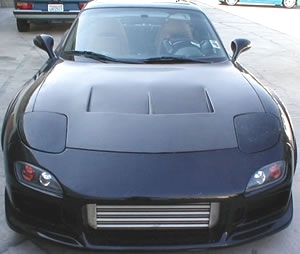 I first considered modifying the stock hood with after market vents but figured for the cost was too much, might as well just do the whole hood. As far as hoods go every time I found a hood I liked I'd look at the price and decided it wasn't worth it. Mazdaspeed $1500, C-West $1350, REAmemiya $1450, Panspeed $1100, Scoot $1150-$1500 [blech anyway] etc. 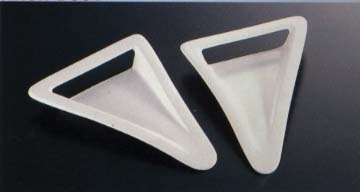 etc., even the fiberglass knockoffs were $750 and up and this didn't even include paint! "Uh. No thank you." I wanted the hood for the performance and reliability gains and not necessarily for the aesthetic reasons but a good looking hood would still be nice. Given this I found no real reason for a Carbon Fiber hood. I wanted to paint it anyway .And also after removing the stock aluminum hood from my car during the installation process I believe it was a wise decision NOT to choose carbon fiber. A few pounds of weight savings for a part almost triple the price I paid for the hood I chose IMO just isn't worth it. So what did I choose? It just so happened I met a gent at a MSCW MADS event who had a prototype 4 vent hood from Pettit Racing. Two large forward vents right behind the radiator and intercooler exhausts and two vents on either sides near the windshield to extract hot under hood air , particularly right above the turbo's. Each vent was nicely blended into the surface with what I would consider the proper aero design, i.e., a lip at the leading edges to trip up the air flow for better heat removal from under the hood. I examined the underside of the prototype hood and there was plenty of cross bracing and it was pretty stiff and not very flexible at all. And as far as the weight goes it was neigh on identical to the aluminum stock hood so there was no weight penalty from making the swap. And too top it off I later learned, after seeing some photo's on a Japanese website that this was indeed a replica of a hood made by Knightsports, a Japanese RX-7 tuner. 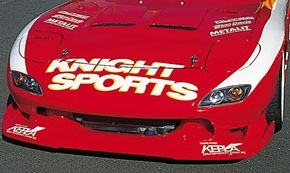 I was unaware of that Pettit's hood was indeed a Knightsports replica when I first saw it. When I pursued the price for the hood I was pleased to find out it was sold at a reasonable price. Almost $200 lower (at the time) than any other hood I'd seen worth considering. Several hoods I've seen that were sold at very low prices weren't worth the price of the materials they were made of. Made too thin, very poor finish and fitment that was terrible - with major gaps and uneven edges. Not finish problems but major structural problems. This is the kind of hood I would not want to be faced with and part of the reason I was so leery of spending this kind of money on a part. So I took the first step and ordered the Pettit hood. Disclaimer: All images contained on this page are the sole property of C. Regan unless otherwise noted.